If you’ve been reading my blog, then you would probably have read about how crazy I am about books here. But the problem with having started reading way too many books, way too early is that I often find that either I've forgotten half of what I've read or muddle up one book with another. Added to that, now with so many books being converted into celluloid, it gets even more confusing. You see, when I read a book, I almost always have the story running in my head. And then I go watch the movie. So at the end of day, I have 3 stories albeit with slight variations – one that I've read, one that I've seen and one that I've imagined! You can understand then, that sometimes I simply cannot recollect if some incident actually happened in the book or in the movie or simply happened only in my imagination. Does anyone else have this problem, or should I fix an appointment with a psychiatrist asap? This must be one of the very rare books that I’ve read after watching the movie first. Obviously I thought that the movie was charming, after all I love Meryl Streep as I’ve mentioned earlier. Although I am addicted to watching cooking videos l must confess that I have never seen any of Julia Child’s shows-although she does seem to be pretty enigmatic. Julie & Julia is in a way, every blogger’s dream come true. I mean there you are, stuck in a monotonous job , when you decide to start a blog while eating scrumptious French food almost always cooked one way or the other in butter, only to find that gradually the blog becomes a super-hit and the next thing you know, it has been turned into a book and a movie to boot. Now you can kick that boring old job goodbye and become a freelance writer/food critique or whatever else you fancy! Sounds lovely, doesn’t it?! The premise of this book then, is pretty straight forward. 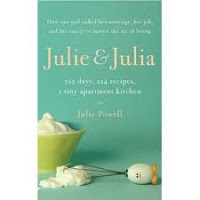 Julie gets the idea that she should complete all the 524 recipes in Julia Child’s magnum opus, Mastering The Art Of French Cooking, within 365 days, no matter how daunting they recipes seem to be. In Barney Stinson style, she goes “challenge accepted” and starts off, in her own words, “risking her marriage, her job and her sanity to master the art of living”. Although at times, Julie turns philosophical, drawing parallels between her chosen mission and her life, she doesn’t get preachy on you. She comes across as a normal, girl next door, with pretty mundane problems that are to be expected in the life of any urban woman in her late twenties, trying to figure out a purpose behind her routine life. The sarcastic and sometimes irreverent humour of the author made me smile a lot. The story, itself is of course, quite different from other such books and I know that it has spurred many young women to take up similar challenges. (One such being here). But I do think that it is more of a feminine book and I doubt if many men will enjoy reading it(case in point, my husband fell asleep halfway through the movie and refuses to read the book. Oh well, you win some you lose some ;-)). On the whole, Julie & Julia is written in a breezy kind of way and I would classify it as a light and enjoyable read, perfect for relaxing while sipping on some aromatic cardamom tea. Have you read Julie & Julia or watched the movie? Let me know what you think! Do read and tell me what you thought of it! Hope u enjoy it! Yay! Join the club :). Thanks for the multiple generous mentions of my ramblings ;). I started writing about books for precisely the same reason. Now, if I go back and read what I've written about a book, it seems unreal that I remembered so much then :).